One of Housing New Zealand’s goals is that “No community will have more than 15 percent state housing presence” . I don’t know exactly what that means. There is no standard definition of a community. There’s a great deal of difference between reducing the proportion of state housing in a block, in a neighbourhood, or in a suburb. However, perhaps we can learn more about the goal by looking to two current major HNZ redevelopments. In northern Glen Innes, 156 state houses have been or will be removed or demolished in order to build 260 new houses, 30% of which will be state-owned, and a further 15% of which will be owned by community providers. In Pomare, 89 state houses were demolished in order to build 150 new houses: “up to” 13% owned by the state, and a further 13% owned by community providers. The proportion of state housing in those neighbourhoods will drop. High concentrations of state housing in some areas are associated with social deprivation. By reconfiguring its portfolio, Housing New Zealand will endeavour to reduce concentrations of state housing and create mixed communities, which has been shown to produce better social outcomes. This will involve major redevelopment of underutilised Housing New Zealand [sic], and working in a more innovative way with the private and third sectors . Juvenile delinquency in new housing settlements might conceivably be reduced, if, in future, State houses were not erected in extensive blocks, but were built in such smaller numbers as could be more easily integrated into existing communities of people . Mazengarb in 1954 and Housing New Zealand in 2013 agree that state housing should be part of more mixed communities. In 1954, it was because state houses of the time were brand new settlements with many children and few amenities. In 2014, it’s because state tenants are among the poorest New Zealanders, and it’s thought the poor should be be dispersed for their own good. It shouldn’t surprise us that, as HNZ puts it, high concentrations of state housing is associated with high levels of deprivation. State housing used to house people with a range of incomes; indeed, some still do pay market rent. However, these days, HNZ aims to house only the very poorest, and only while they remain extremely poor: “those in need, for the duration of that need” . Since 2011, HNZ only adds people to its waiting lists who are “at risk” (category A) or who are in “serious” (significant or persistent) need . In linking mixed communities to better social outcomes, HNZ draws on the literature on “neighbourhood effects”: the idea that where you live affects your life chances. If you grow up in a poor neighbourhood, you may be more likely to be exposed to crime, for example, and you may have access to less amenities and education and work opportunities. Of course, your outcome can be affected by many other things apart from neighbourhood – your health, an income, a supportive family, to name just a few. There is a research problem here described nicely by Treasury a few years ago: “the difficulty of working out whether disadvantaged communities appear because disadvantaged people choose [or, in the case of state housing, were placed] to live together, or because living together also worsens their prospects” . However, a review of the New Zealand literature supports the fact that the considerable variations in health status across neighbourhoods in New Zealand “probably cannot be entirely explained by compositional arguments”  – i.e. who happens to live there. While we can probably agree that place matters to social outcomes, it’s what happens next that is divisive. If many poor people leave Glen Innes or Pomare, it’s probable that the health of the people that live there will improve. But much of this effect will be explained by the fact that different people live there. We can see this by looking at a study of Auckland surburbs. While the amount of hours of paid work decreased between 1986 and 1996 for inhabitants of Otara and Glen Innes East, the amount of hours worked by people in Point Chevalier South increased. This wasn’t because the fortunes of the inhabitants improved – it was, in the words of the authors, because of gentrification. Former state houses, in a prime location due to the expansion of the city, were sold to private buyers, who had higher incomes . Evidence suggests that housing displacement and subsequent relocation is a traumatic experience with considerable short term and long-term health costs. Such costs associated with displacement, for example, social support networks, employment and economic capital affect not only the displaced residents but also the dispossessed communities they leave behind and the communities who receive such displaced residents . The “renewal” of Glen Innes and Pomare and possibly other communities, through the deconcentration of state housing, benefits people. However, it also displaces people, and the benefits of the new communities will not be experienced by everyone. 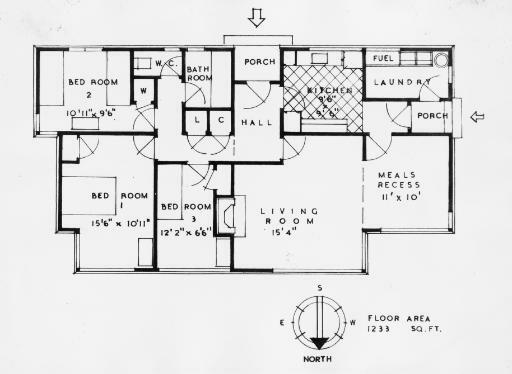 Floor plan of a 1930s state house. MNZ-2150-1/4-F. Alexander Turnbull Library. Public domain.